CHEM Menu Show search box. Jinsong Zhang was born in Ningan, China. She obtained a bachelor’s degree from Shandong Normal University, Jinan and a master’s degree from Chinese Academy of Sciences, Beijing, China. She then moved to The University of Montana, Missoula and received her PhD degree in organic chemistry in 2003. Under the instruction of Dr. Donald E. Kiely, her PhD research focused on Poly(alkylene D-aldaramides) synthesis and conformational studies of the corresponding polymers. She received several academic awards that included the Stanley R. Ames Scholarship (2002, 2000), Bertha-Morton Graduate Student Scholarship (2001), and Lola Walsh Anacker Scholarship (1999). Shortly thereafter Zhang joined the Pettus (Thomas, R. R.) group at University of California, Santa Barbara as a postdoctoral researcher working on natural product total synthesis and method development. She was appointed to the Department of Chemistry and Biochemistry at California Polytechnic State University, San Luis Obispo, as a lecturer teaching general chemistry and organic chemistry in 2005 - 2006. In the summer of 2006 Zhang joined the faculty at California State University, Chico and supervised two undergraduate students’ research. Her research interests include natural product total synthesis, synthetic method development, bio-organic chemistry, drug design, medicinal chemistry, spectroscopic studies, conformational studies, and synthesis of environmentally friendly polymers from renewable resources. 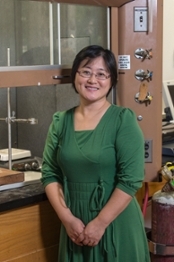 Zhang teaches a variety of courses ranging from organic chemistry to general chemistry, including the associated laboratories with her well organized courses and solid curriculum. In addition, she is very excited to have the opportunity to work with student researchers, with the enduring goals of providing both scholastic achievement and adequate career training. Synthesis of natural products that contain biological activities and method development for synthesis. Neolignans 1 - 6 (Figure 1) were recently isolated from Rodgersia podophylla (Saxifragaceae). The rhizomes of this plant have been used for the treatment of enteritis and bacillary dysentery and have been reported to exhibit antipyretic, analgesic and hepatoprotective effects. Neolignans 1-6, which contain a 1,4>-benzodioxane structure, have demonstrated a variety of biological activities. Synthesis of the 1,4-benzodioxane core structure of these neolignans via a hetero-Diels-Alder reaction between an ortho-quinone and an appropriate dienophile is studied in Zhang's group, which could provide a generic method for the synthesis of 1,4-benzodioxane-based natural products. Biological activity screening of neolignans 1-6 (in conjunction with Dr. Larry Kirk) will be performed in order to provide information about the potential pharmaceutical applications of the target neolignans. Students working on this project usually have (or intend to have) a commitment of two semesters and a summer continuously to achieve concrete progress. Diels-Alder reaction between ortho-quinones and a variety of dienophiles have been studied via both bench top synthesis and computer simulation. Predicting reactivity by computational study leads to verification of synthesis result. Student interested in computer simulation, spectroscopy and synthesis (integrated) are encouraged to consider involve in this research. Study of ortho-quinone synthesis, including regioselectivity, mechanism, and utilizing polymer bound hypervalent iodine reagent, has been carried out in Zhang's lab. Computer simulations often help explain the experimental result. This is another integrated research, including organic synthesis, polymer synthesis, kinetic study, spectroscopy, various chromatography and computer modeling. Student can work on one aspect of the research or a few aspects of the research depending on time and effort a student can put on.